Borrowing is never recommended after a layoff. But sometimes you have to do what you have to do. There are a lot of not-so-smart ways to borrow money, particularly when you are in desperate need of funds. Title loans certainly come to mind. But there’s a high risk of losing your car in the process, not the least of which because you don’t have a job to repay the loan. You can also turn to credit cards. After all, you can use the credit lines without having to qualify based on your income or credit, so the whole process is pretty much effortless. The ease of accessing money for credit lines is also the built-in problem. Once you get started, when do you stop? Tapping credit cards for cash can create a vicious cycle that continues until you’re unable to repay the loans. Worse, cash advances on credit cards generally carry higher interest rates than for purchases. Loan salvation these days is increasingly coming from peer-to-peer sites, that enable you to borrow money while bypassing the banks. The loans also typically come with both fixed rates and payments, making the repayment process totally predictable. Best of all, you may be able to arrange a loan from family or friends through a peer-to-peer lending site. Borrowing should be avoided at all costs if you have been laid off from your job. But if you absolutely need a loan, peer-to-peer sites may be the best way to do it – even if the proceeds for the loan ultimately will come from family and friends. When You Can’t Get a Loan from the Bank . . . The inherent problem with getting a loan from a bank – other than existing credit lines – is that you can’t qualify because you don’t have a job. That limits your options, no matter where you want to borrow money. But peer-to-peer lending sites offer the opportunity to match the lender with the borrower. If you need to borrow money, and a family member is prepared to lend it, you can meet on a peer-to-peer lending site and make it happen. The sites offer the opportunity to formalize the loan process, and that has a number of advantages to both parties. From a borrower standpoint, one of the biggest problems with getting direct loans from friends and family is that it can very easily lead to misunderstandings. You might borrow money with the intention that you’ll begin repayment once you regain employment. But the friend or family member making the loan might expect repayment to begin immediately. In either case, any time expectations are not met in a loan situation between family and friends, misunderstandings can develop. And when you do business with family and friends, the potential damage from the fallout of a loan agreement can go well beyond money. You risk permanent damage to a very important relationship. Formalizing the loan arrangement can help prevent the type of misunderstandings that cause problems in the first place. You and your “lender” can work out whatever terms are agreeable to all parties. There is no bank process to go through since the lenders – your family or friends – choose the terms that are acceptable to them. And once settled, there is an agreement with a repayment term that includes the interest rate and monthly payment. Another advantage comes when you’re looking to borrow a single loan from several different friends or family members. A peer-to-peer lending site could enable you to create a single loan in which you are the lone borrower, but there is more than one friend or family member acting as lenders. Family and friends making loans face a double risk in doing so. Not only is there the same risk of permanently damaging an important relationship – just as you as the borrower would face – but they also risk the potential of losing some or all of the money that they provided for the loan. For this reason, they may prefer formalizing the loan agreement through a third-party source, such as a peer-to-peer lending site. Sure, you could all sit down and hash out a formal loan agreement, using a standard loan agreement forms. But unless someone in the group is a lawyer, doing it that way may be completely un-enforceable in court. Repayment of the loan through a peer-to-peer lending site does not guarantee that the loan will be paid, but it does create the proper framework that will prevent misunderstandings, and maximize the lender’s ability to be repaid their money with interest. There is another reason why family and friends may prefer to use a peer-to-peer lending site to formalize making a loan to you. Under IRS regulations, the transfer of funds from one person to another exceeding $14,000 could be construed as a non-repayable gift. That could create a gift tax liability for the lender, particularly if you fail to repay the loan. Setting up a loan through a peer-to-peer lending site would provide an acceptable paper trail that would prevent the IRS from re-classifying the loan as a taxable gift. 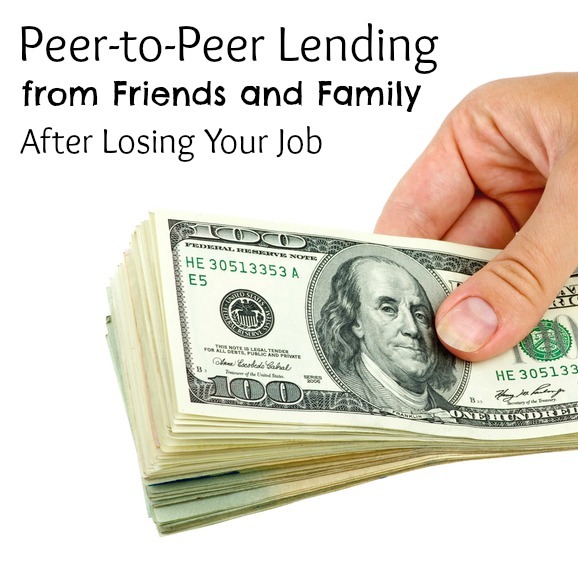 How do you use peer-to-peer lending sites to create a loan from family and friends? If you need to borrow money, you can go to a peer-to-peer lending site and create a loan listing on that site. This would establish the amount of money that you’re looking to borrow and the terms you’re willing to accept. The friend or family member could go to the site and accept the terms, or even propose modifications. Once you’re both in agreement, the loan can be created. There are now dozens of peer-to-peer lending sites available. Some of the more popular ones include Prosper and Lending Club. One of the complications with Lending Club is that they run their loans through WebBank, so the process is likely to be more formal, though it’s still worth checking out. If you’re looking to do a larger loan amount, particularly one that will be secured by your primary residence, you could also check out National Family Mortgage. As the name implies, they are in the business of creating peer-to-peer mortgages between family members. Once again, if you have been laid off from your job, borrowing money should only be a last resort and only in case of emergency. Your first priority should be to create additional income sources in combination with lowering your living expenses. But failing that – and when borrowing is absolutely necessary – peer-to-peer lending sites could be the way to go. What do you think about peer-to-peer lending sites? Are you going to try one? Leave a comment!